As an intensivist and anesthesiologist, I spend a considerable amount of time pondering the physiology and evidence for practices and questioning dogma rampant in the ICU/OR settings. 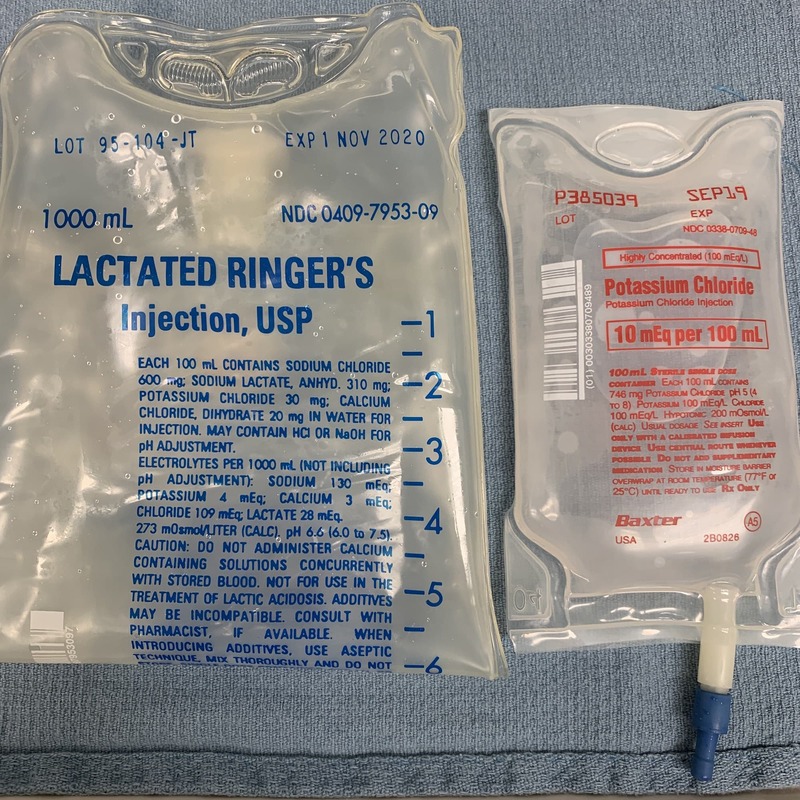 One recurrent theme I’ve heard is the fear of using Lactated Ringers (LR) and Normosol in patients with renal impairment. Why? Because they both contain potassium (K+), and patients with renal impairment not only tend to be hyperkalemic and acidotic but have difficulty in clearing potassium. LR and Normosol have 4 mEq/L and 5 mEq/L, respectively, of potassium. In the context of acidosis, H+/K+ channels exchange protons for potassium thereby increasing serum potassium. Additionally, potassium equilibrates between the intracellular AND extracellular compartments (high volume of distribution). You can’t just “add” the potassium from intravenous fluids to the patient’s preexisting serum concentration. In reality, infusing a solution with less potassium than the patient will actually DECREASE the serum concentration to that of the infused solution. Couple this with the fact that LR and Normosol are both alkalinizing solutions, and the acidosis is offset shifting the H+/K+ ATPase channel back in the opposite directly (more potassium shifted intracellularly thereby DECREASING serum concentration). Also, don’t forget that NS can potentially complicate matters with a superimposed non-anion gap, hyperchloremic metabolic ACIDOSIS due to the chloride load. Finally, there are several prospective RCTs in renal transplantation which looked at potassium changes with LR versus NS administration. Surprise! Patients who received NS had a greater increase in potassium and often a lower serum pH. Admittedly, the intraoperative administration of fluid is somewhat different than maintenance fluid/boluses, but it sure makes you feel reassured that LR is safe in patients with renal impairment.